Excitement was most certainly the order of the day; way before GABRAN (Great Annual Bicycle Ride Across Natal) 2014 registration commenced on the cold and breezy morning of the 22nd August at ATKV-Drakensville. 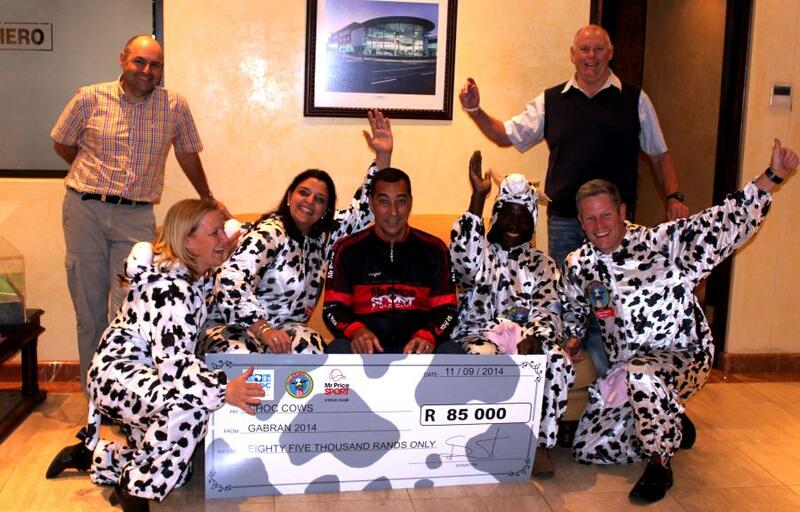 The Durban Cow Herd could not believe our “hides” on the generous sponsorship of various goodies for our goodie bags. We spent close on 3.5 hours packing 150 bags for our Gabran Cycle Tour Participants. Not only were our cyclists going to get the odd 300km “mileage” on their legs, but most certainly a full body workout lifting the sponsored bags! The three day Great Annual Bicycle Ride Across Natal has been revived. Thanks to the support of the Mr Price Sport Cycle Club spearheaded by Kelvin du Sart. The Ride began on a cold and breezy morning at the ATKV Drakensville resort and winds it way up hills and down dales to Hillcrest. The cycle tour, went off smoothly, 300 odd kilometres of cycling, over 3 days, up and down hills and dales, across our beautiful KZN province, witnessing snow-capped mountains, trickling waterfalls, from sunrises to sunsets and everything inbetween…. Tents, bags, camping chairs, (everything but the kitchen sink!) were loaded into the 4 ton truck, and transported from start to finish! Pitching tents for our overnight stops, new friendships being formed, many photographs being taken, and memories that will last all those that took part – a lifetime. This is most certainly KZN most beautiful cycling event – This is not a timed event at all, and it is a gentle pace event. Various compulsory grazing stops are on route, the first being the Winterton Country club that provided a enough sandwiches to feed the hungry cyclist and hot tea, coffee and for the brave some cool juice to quench the thirsts. A merry gathering of cyclists, sharing war stories, puncture repairs, some more puncture repairs and just a general feeling of “love living life” was portrayed, We rolled out of Winterton Club heading towards Escourt…. The rolling hills changed and became rather harsh up, up, ups and a down only to be followed by more never ending up hills on route to Wagensdrift dam. Day 2 saw the climbs out of Escourt, and rolling through Mooi River, and down to Midmar Dam, where tents were being blown in all directions in the uninvited gale force winds! This was a challenge to the weary cyclist, but we persevered and were not going to allow the wind to get the better of us. The third day dawned too soon, as cyclist took the fast decent into Martizburg with caution, and then onto familiar territory of the Amashova Cycle Route. Hillcrest was the finish line. The aim of the event was to raise funds for the COWS that are the fundraising arm of CHOC (Childhood Heamotology Oncoloy Clinics). GABRAN helped us raise much needed funds for our little superheroes fighting various forms of Cancer! We were blown away when we counted the moo-lah, did the various mathematical calculations and came to a grande figure of R40 000! We could not believe our “hooves”… this was, however, rather short lived. 10 days later, Liviero, who had sent some riders on this event, confirmed a further donation of R45 000 to the cause. 3 days of fun, sweat and laughter, concluded it was indeed a successful event. Once again we thank all the riders and sponsors from the bottom of our “hooves” for your support and contribution to making GABRAN 2014 what it was!